The soaring ice mountains of Pluto are accompanied by wide plains and mysterious deep troughs, show photographs received from NASA’s New Horizons spacecraft. Dr. Moore and other mission scientists described some additional data received during a press conference held on Friday. It has been a busy and exciting week for the team, as they try to make heads and tails of some of the more puzzling of images. “I’m a little biased, but I think the solar system saved the best for last,” said S. Alan Stern, principal investigator for New Horizons. It took the craft nine and a half years to journey the three billion miles to Pluto, and passed within 7,800 miles (roughly 12.553 km) of its surface on Tuesday. It was traveling to fast to be able to enter the dwarf planet’s orbit and zipped past, leaving it more than two million miles behind by now. The spacecraft is expected to gather a huge amount of data: by the end of the month, its on-board memory is estimated to hold 50 billion bits of data. Due to the slow speed at which communications can be carried out over interplanetary distances, however, only 2 percent of it has been sent back to us. The first close-up snapshot of Pluto, released on Wednsday, show its mountains to be 11,000 feet high bodies of water ice, not rock. What came as a surprise is that there were no craters on this part of the planet, of about 150 by 150 miles wide. Craters have been spotted in the global view of Pluto, and other regions could be geologically much older. The new snapshot described by Dr. Moore on Friday was near the mountains and likewise devoid of craters, but it was almost flat. The lack of craters indicates that the surface was erased by erosion or tectonic activity in the recent geological past — within the past 100 million years. 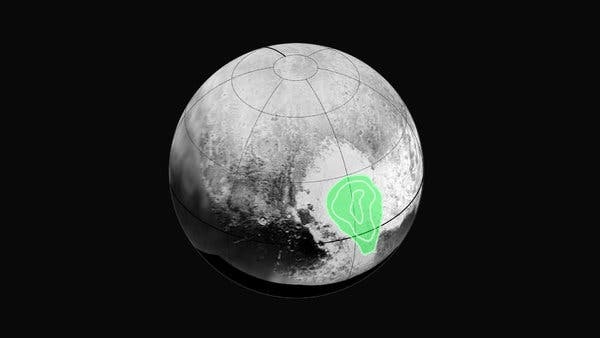 Measurements of New Horizons’ “Ralph” tool found carbon monoxide ice, represented by the green graphic, on the western end of Pluto’s heart-shaped region. “This could be only a week old, for all we know,” Dr. Moore said. Another possibility is that they could be similar to mud cracks on Earth, caused as the soil dries and contracts, Dr. Moore said. The shapes are reminiscent of those seen near the north pole on Mars, but it was too early to tell if similar geological processes had shaped them.